Designed to pay tribute to Case's company founder, John Russell Case, the Damascus steel version of this fine pocket folder won Popular Mechanics' Editor's Choice Award in 2007. Case continues to make the knife in the BG-42 steel version, taper ground and polished to perfection. Tempered to HRC60, the alloy steel holds an edge well and sharpens easily. Other fittings in the knife are equally well made. The pivot bearing tension adjusts with a screw found in the nickel silver bolster, guaranteeing proper one-handed opening even as the knife ages. The drop point blade snaps into open position with a solidly built stainless steel liner lock. Although the knife is pocket-sized -- 3-1/2 inches when closed -- this is a fairly heavy knife for pocket carry. Weighing 6.8 ounces, the Slimlock feels like a fixed blade and rides much easier in the leather carrying sheath that Case provides. In 2007, John Sullivan -- Case Director of Marketing -- called the Slimlock "the finest, most modern pocket folder ever offered by Case." That may still be true, at least in terms of "gentleman's knives." 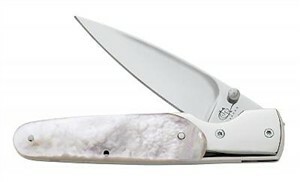 For another modern pocket knife from W.R. Case & Sons, see the Case Stag Trapperlock.